The Franklin County Visitors Bureau invites all to try the delicious, sweet peaches being produced by the local orchards into September. Franklin County orchards are bearing delicious peaches all summer and many are expected to be producing through Labor Day. August is National Peach Month and peach eaters for decades have known that “Chambersburg peaches” are among the sweetest and juiciest. Franklin County orchards are bearing delicious peaches all summer and many are expected to be producing through Labor Day. Shatzer’s Fruit Market started its season with Sun High and Loring peaches to sell. “These are all freestone peaches and are yellow, sweet and juicy,” a representative from Shatzer’s said, adding that the peaches will be available and picked this year until the middle of September. Later on in August, Cresthaven peaches will be picked for the market. Benedict Produce in Chambersburg is selling several different varieties of freestone peaches as well. A freestone peach is easier to remove the flesh of the fruit around the pit which makes it quicker to process for sliced canned peaches or pie making. Tawnya Tracey, co-owner of Tracey’s Orchards in Greencastle, said that this year has been a wonderful one and they are “very blessed” with their peach crops this year. The orchards have over 20 different varieties of peaches through mid-September, including earlier varieties such as Harbinger, Flaming Fury and more mid-season and early August peaches like Sun Haven, Sunhigh and Loring. The later season has other varieties such as Jersey Queen, Laurel and Victoria. Other common peach varieties include Redhaven, Rich May, Garnet Beauty, Redskins, Biscoe and more. Redhaven peaches are among the earlier varieties of peaches in the season and is a semi-freestone which can be used for canning, freezing or just enjoying as a healthy snack. Franklin County is home to an abundance of orchards, farms and fresh markets ready to be explored. 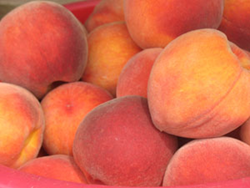 For more information on peaches and the fresh foods of Franklin County, check out the Franklin County Visitors Bureau’s Franklin Fresh guide. The Franklin County Visitors Bureau invites all to explore Franklin County PA and enjoy the history, arts, recreation, natural beauty, fresh foods and warm hospitality of communities like Chambersburg, Greencastle, Mercersburg, Shippensburg, and Waynesboro. Franklin County PA is located just north of the Mason Dixon Line and an easy drive to Washington DC, Philadelphia, and Pittsburgh. Discover more….plan your visit at ExploreFranklinCountyPA.com , by contacting 866.646.8060, 717.552.2977 or by paging through the online visitors guide.